I never had any interest in Julia Child (the things she cooked didn't appeal to me) until the movie Julie & Julia. It left me wanting more Julia. That could be in part to Meryl Streep's performance; she was so good! Also, I had no idea that Julia Child lead such a fascinating life. I wanted more. 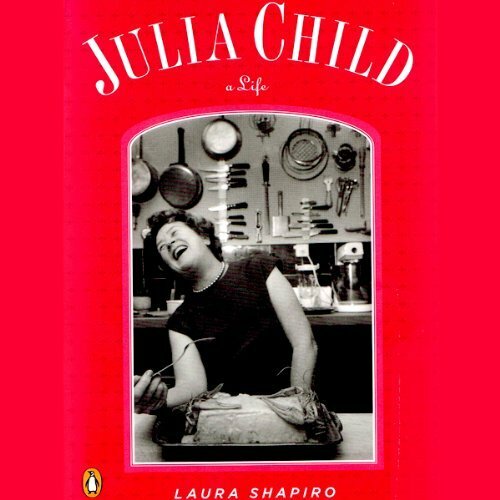 I came across Julia Child, A Life by Laura Shapiro in my library's audiobook catalogue and decided that though it might not be straight from Julia, it was a start. It began with Julia's very privileged life. Her parents had the money to send her to college when it was time. She was a mediocre student who loved to party. When her plans to marry and settle down never happened, Julia was nonplussed. Instead, she decided to travel and meet new people. She met her future husband Paul Child while working for the government in the intelligence sector. Though Paul was interested in a friendship with Julia, he didn't think she was relationship material. Paul wanted a worldly knowledgeable woman which Julia wasn't. Julia was fun and had great legs but nothing else to offer Paul or so he thought. The fact that they became such an inseparable couple is attributed to Julia. The force of her personality won him over. Julia was a terrible cook but she loved to eat. When she and Paul moved to France, she enrolled in the Cordon Bleu School and went into the class with determination. Eventually she met the two women who would change her life: Simone "Simca" Beck and Louisette Bertholle. For years they worked on perfecting the work that would become Mastering the Art of French Cooking. The ladies wanted a comprehensive cookbook for American audiences. There were many ups and downs but in 1961 it was finally published. While promoting the book, Julia did an omelette demonstration for a WGBH book review show. The audience was so impressed the station offered her her own cooking show. Julia became an 'overnight' sensation and the rest is history. Throughout the book, Julia passion and positivity shines. I felt like a more optimistic person just listening. What impressed me most was how she was 36 when she started classes at Cordon Bleu which ended up being such a life altering experience. It's inspiring to this 37 year old. Julia had so many disappointments and obstacles thrown in front of her yet she persevered. I don't think she ever thought she could fail. Julia was not perfect of course. She had contradicting parts to her personality: she hated feminism yet fought for the equality of female chefs, hated bigotry yet had a distaste for gay people. She had nothing good to say about people in organic farming and thought they were dangerous. Good food, she believed, was the product of the cook not the ingredients. Shapiro does a good job balancing all the aspects of her personality. Julia was, after all, a real person with real frailties and a product of her time. I enjoyed Julia Child, A Life. What a great success story and a wonderful love story. And the great thing is, it's not fiction! It's also a quick read. I suspect there are more thorough biographies (and Julia's My Life in France) but this was a good start for me. 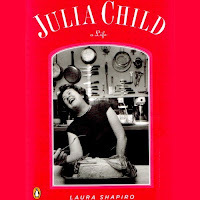 Recommended for those curious about Julia Child. Julia Child was really fascinating! I bet my husband would love this book.